JARANA RECORDS. VINYL RECORD STORE. Right in the heart of Palermo, near Plaza Serrano since 2016. We specialized in selling, buying and trading vinyl records and accessories. We handle a vast collection with more than 5.000 albums, new and used records. Our bins offer a fine selection of music genres, including rarities, special editions and some first pressings of argentine rock to the newest releases and reissues. Our online store is periodically updated. We take MercadoPago and credit cards of all banks. We offer local shipping. Our Online store is periodically updated. We take MercadoPago and credit cards of all banks. We offer local shippings. 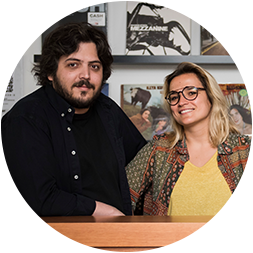 Going along with the growing appreciation of analogue sound we decided to focus on the vinyl format, and as music lovers as well as compulsive collectors, we’re convinced that the unique experience of listening to a vinyl album starts at the record shop. That’s why we love Jarana Records, a place for those who enjoy spending countless hours browsing through the bins. Pets are more welcome than people.